wintering in Bharatpur, northern India. Dravecký M, Sellis U, Bergmanis U, Dombrovski V, Lontkowski J, Maciorowski G, Maderič B, Meyburg B-U, Mizera T, Stój M, Treinys R & Wójciak J 2008: Colour ringing of the Spotted Eagles (Aquila pomarina, Aquila clanga and their hybrids) in Europe – a review. Slovak Rapt J 2: 37–52. Meyburg B-U, Graszynski K, Langgemach T, Sömmer P & Bergmanis U 2008: Cainism, nestling management in Germany in 2004–2007 and satellite tracking of juveniles in the Lesser Spotted Eagle (Aquila pomarina). Slovak Rapt J 2: 53–72. Maciorowski, G., B.-U. 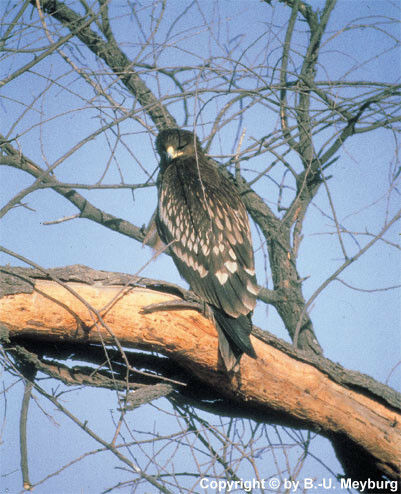 Meyburg, T. Mizera & J.Matthes 2009: Current scientific research for supporting the protection of the Greater Spotted Eagle in Biebrza valley. Proceedings of the Center for Nature and Forestry Education 2 (21): 68-74. Ragów, Poland (In Polish with an English summary). Väli, Ü., V. Dombrovski, R. Treinys, U. Bergmanis, S. J. Daróczi, M. Dravecky, V. Ivanovski, J. Lontkowski, G. Maciorowski, B.-U. Meyburg, T. Mizera, R. Zeitz & H. Ellegren 2010: Widespread hybridization between the Greater Spotted Eagle Aquila clanga and the Lesser Spotted Eagle Aquila pomarina (Aves: Accipitriformes) in Europe. Biological Journal of the Linnean Society 100: 725-736. Microsatellites and single nucleotide polymorphisms in avian hybrid identification: a comparative case study. J. Avian Biol. 41: 34-49. Fiuczynski, K. D. , A. Hallau, V. Hastädt, S.Herold, G. Kehl, G. Lohmann, B.-U. Meyburg, C. Meyburg & P. Sömmer 2010. Der Baumfalke in der modernen Kulturlandschaft. Greifvögel und Falknerei 2009/2010: 230-244. .
Meyburg, B.-U., K. Graszynski, T. Langgemach, P. Sömmer, A. Hinz, I. Börner, E. Schmidt, C. Meyburg & U. Bergmanis 2010. Experience with the Hacking method for support of the Lesser Spotted Eagle (Aquila pomarina) population in Brandenburg (Germany). / Erfahrungen mit der "Hacking"-Methode zur Stützung der Population des Schreiadlers (Aquila pomarina) in Brandenburg. 7th international symposium "Population ecology of birds of prey and owl species" Halberstadt, 21 -24.10.2010: Poster / 7. Internationales Symposium "Populationsökologie von Greifvogel- und Eulenarten", Halberstadt, 21.-24.10.2010: Poster.